On Monday, Jan. 29, the Amity Spartans Swimming and Diving team was on the road at Albertus Magnus for a meet against Notre Dame. As you may know, the Spartans, under the leadership of Coach Todd Rainey, only lost one game this season — that was to Fairfield Prep. The boys had no problem defeating Notre Dame 102-81 here. 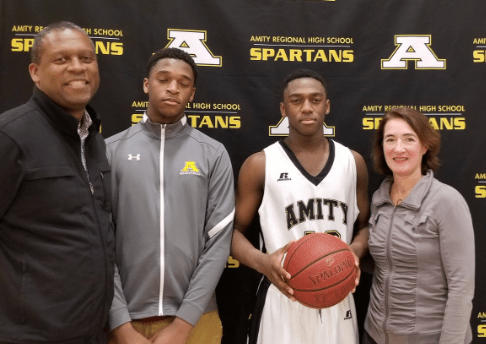 The Amity Spartans hosted Notre Dame-West Haven Green Knights in Woodbridge on Monday, Jan. 8. Amity (5-1) experienced its first loss of the season to Notre Dame (5-3) and it was a tight one 78-77. This nail-biter of a game included Amity’s Tyler Thomas scoring the game-high 47-points, including six 3-pointers, and his 1,000th point. What’s amazing is that he reached the milestone in just 2.5 years. Congratulations Tyler! Notre Dame: Connor Raines 6 9-11 21, Zach Laput 5 6-6 20 (including four 3-pointers), Mike Brooks 4 7-7 17 (including two 3-pointers), Alec Kinder 5 4-4 14, Justin Corrington 1 0-0 3 (one 3-pointer),Trevor Setzer-Smith 0 2-2 2, Jaiden Kimbro 0 1-2 1. Totals: 21 29-32 78. Amity: Tyler Thomas 16 9-14 47 (six 3-pointers), Joe Benedetti 5 3-4 14 (one 3-pointer), James Van Hise 4 1-2 10 (one 3-pointer), Quinn Burke 1 0-0 3 (one 3-pointer), Cole Wissink 1 0-0 2, Chris Bierezowiec 0 1-2 1. 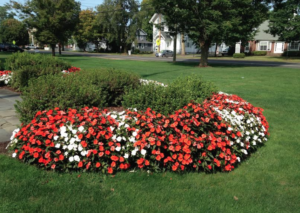 Totals: 27 14-22 77. 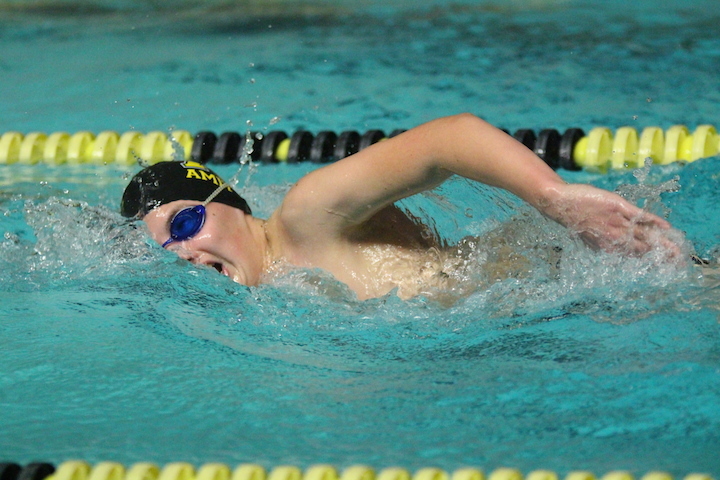 On Tuesday, Feb. 10, the Amity Spartans Swim and Dive Team faced up against Notre Dame at Wilbur Cross. 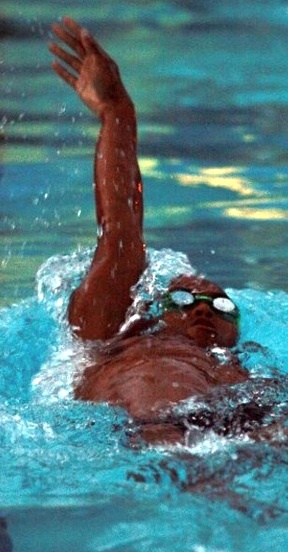 The Green Knights splashed past the Spartans, winning this meet 98-83. The Amity Varsity Lacrosse Team celebrated its first season win on Wednesday after defeating Notre Dame 8-7 in West Haven. Coach AJ Alessi of ND had his team ready to go in his first game as their new Head Coach. Coach Pepe is very familiar with Alessi as the two used to compete against each other while Alessi played attack at Branford, and Pepe was the goalie for Amity, both graduating in 2005. 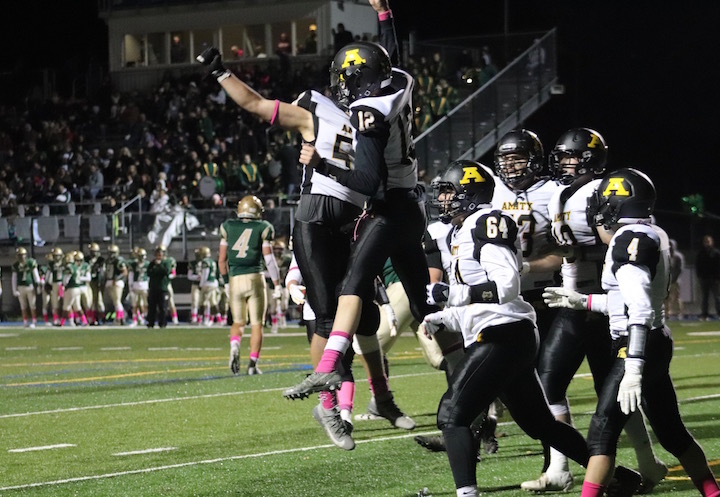 Next up is Branford at home on Friday, April 11, at 4 p.m.
After senior Joe Choiniere scored from one yard out to cut the score to 24-20 with 3:39 left in the third quarter, Amity was with within a single score in the second half. After losing back-to-back games where they never trailed by less than two scores in the second half, the Spartans were primed to break a two game losing streak. But, once again, Amity yielded too many big plays on the ground and committed untimely turnovers as Notre Dame scored two fourth quarter touchdowns to win 38-20 Friday night in West Haven. With eight minutes left in the game trailing by 4, Amity fumbled on an option play to the left side of the field. Four plays later, Notre Dame senior Cameran Tucker scored on a 15-yard run with 6:03 left to increase the lead to 31-20. On Amity’s ensuing drive, senior Dave Ryan was intercepted by senior linebacker Sal Esposito. Notre Dame put the game away on a methodical and time consuming 10 play, 46 yard drive ending in a 4-yard Tucker touchdown. Tucker rushed for 101 yards on 27 carries. Notre Dame rushed 48 times for 290 yards. Notre Dame started the scoring with 5:46 left in the first quarter on a Esposito 9-yard touchdown run. After an Amity three and out, Esposito ran for his second touchdown from 14 yards away on the drive’s first play. Esposito ran for 134 yards on just 12 carries. The run was set up by a 57-yard punt return by senior Drew Arciuolo and made the game 14-0. Amity cut the lead in half on the following drive, scoring after just four plays on a Choiniere 35-yard touchdown catch with 2:32 left in the first quarter. After a Notre Dame missed field goal and trade of punts, Amity tied the game on a 9 play, 64 yard touchdown drive capped by a 3-yard touchdown run by Cory Ricks with 1:10 left in the first half. Notre Dame added a touchdown to end the first half on a Tucker one yard to run to push the lead to 21-14. The play was set up by a recovered onside kick and a 41 yard catch by Arciuolo. Ryan was 23-37 for 261 yards with one touchdown and two interceptions. The passing yards were spread out between senior Ben Feola (5 catches, 74 yards), Choiniere (7 catches, 87 yards) and junior Tyler Burns (7 catches, 85 yards). Amity falls to 3-3 with the loss. The Spartans will take on Wilbur Cross Friday night at Amity.